ALTINOZ, O. T. , YILMAZ, A. E. , WEBER, G.-W.
Nature-inspired optimization algorithms can obtain the optima by updating the position of each member in the population. At the beginning of the algorithm, the particles of the population are spread into the search space. The initial distribution of particles corresponds to the beginning points of the search process. Hence, the aim is to alter the position for each particle beginning with this initial position until the optimum solution will be found with respect to the pre-determined conditions like maximum iteration, and specific error value for the fitness function. Therefore, initial positions of the population have a direct effect on both accuracy of the optima and the computational cost. If any member in the population is close enough to the optima, this eases the achievement of the exact solution. On the contrary, individuals grouped far away from the optima might yield pointless efforts. In this study, low-discrepancy quasi-random number sequence is preferred for the localization of the population at the initialization phase. By this way, the population is distributed into the search space in a more uniform manner at the initialization phase. The technique is applied to the Gravitational Search Algorithm and compared via the performance on benchmark function solutions. Y. W. Leung, Y. Wang, Y. W. Leung, "An orthogonal genetic algorithm with quantization for global numerical optimization," IEEE Transactions on Evolutionary Computation, Vol. 5, No. 1, pp. 41-53, 2001. O. T. Altinoz, A. E. Yilmaz, G. W. Weber, "Application of chaos embedded PSO for PID tuning," International Journal of Computers, Communications and Control, Vol. 7, No. 2, pp. 204-218, 2012. E. Masahian, D. Sedighizadeh, "Multiobjective particle swarm optimization and NPSO-based algorithms for robot path planning," Advances in Electrical and Computer Engineering, Vol. 10, No. 4, pp. 69-76, 2010. A. Ratnaweera, S. K. Halgamuge, H.C. Watson, "Self-organizing hierarchical particle swarm optimizer with time-varying acceleration coefficients," IEEE Transactions on Evolutionary Computation, Vol. 8, No. 3, pp. 240-255, 2004. G. Mortinovic, D. Bojer, "Elitist ant system with 2-opt local search for the traveling salesman problem," Advances in Electrical and Computer Engineering, Vol. 12, No. 1, pp. 25-32, 2012. J. J. Liang, A. K. Qin, P. N. Suganthan, S. Baskar, "Comprehensive learning particle swarm optimizer for global optimization of multimodal functions," IEEE Transactions on Evolutionary Computation, Vol. 10, No. 3, pp. 281-295, 2006. O. T. Altinoz, A. E. Yilmaz, "Particle swarm optimization with parameter dependency walls and its sample application to the microstrip-like interconnect line design," AEÜ-International Journal of Electronics and Communications, Vol. 66, No. 2, pp. 107-114, 2012. O. Brudaru, D. Popovich, C. Copecanu, "Cellular genetic algorithm with communicating grids for assembly line balancing problems," Advances in Electrical and Computer Engineering, Vol. 10, No. 2, pp. 87-93, 2010. B. Liu, L. Wang, Y.H. Jin, "An effective PSO-based memetic algorithm for flow shop scheduling," IEEE Transactions on Systems, Man, and Cybernetics, Part B: Cybernetics, Vol. 37, No. 1, pp. 18-27, 2007. J. Kennedy, Y. Shi, R. Eberhart, Swarm Intelligence. San Diego, CA, USA: Academic Press, 2001. E. Rashedi, H. Nezamabadi, S. Saryazdi, "GSA: A gravitational search algorithm," Information Sciences, Vol. 179, No. 13, pp. 2232-2248, 2009. E. Rashedi, H. Nezamabadi, S. Saryazdi, "BGSA: Binary gravitational search algorithm," Natural Computing, Vol. 9, No. 3, pp. 727-745, 2010. P. Bradley, B.L. 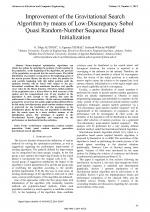 Fox, "Algorithm 659: Implementing Sobols quasirandom sequence generator," ACM Transactions on Mathematical Software, Vol. 14, No. 1, pp. 88-100, 1988. I. M. Sobol, "Distribution of points in a cube and approximate evaluation of integrals," Zhurnal Vychislitelnoi Matematik i Matematicheskoi Fiziki (USSR Computational Mathematics and Mathematical Physics), Vol. 7, No. 4, pp. 784-802, 1967. O. T. Altinoz, A. E. Yilmaz, G. W. Weber, "Orthogonal array based performance improvement in the gravitational search algorithm," Turkish Journal of Electrical Engineering and Computer Sciences, Vol. 21, No. 1, pp. 174-185, 2013. H. Maaranen, K. Miettinen, M. M. Makela, "Quasi-random initial population for genetic algorithms," Computers & Mathematics with Applications, Vol. 47, No. 12, pp. 1885-1895, 2004. S. A. Kazarlis, A.G. Bakirtzis, V. A. Petridis, "A genetic algorithm solution to the unit commitment problem," IEEE Transactions on Power Systems, Vol. 11, No. 1, pp. 83-92, 1996. E. Rashedi, H. Nezamabadi, S. Saryazdi, "Filter modeling using gravitational search algorithm," Engineering Applications of Artificial Intelligence, Vol. 24, No. 1, pp. 117-122, 2011. P. N. Suganthan, N. Hansen, J. J. Liang, K. Deb, Y. P. Chen, A. Auger, S. Tiwari, "Problem definitions and evaluation criteria for the CEC 2005 special session on real parameter optimization," 2005 IEEE Congress on Evolutionary Computation (CEC 2005), pp. 1-5, 2005. Citations for references updated on 2019-04-20 21:40 in 109 seconds.